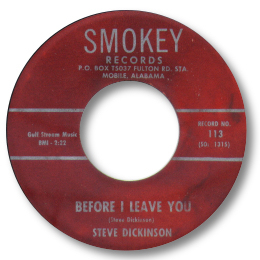 Steve Dixon’s small number of 45s belies a fine singing talent. Like so many vocalists he found that distribution and luck are as important as any other factors in securing success - but sadly neither came his way. His real name was Steve Dickinson and he came from – and recorded in - Mobile, AL. 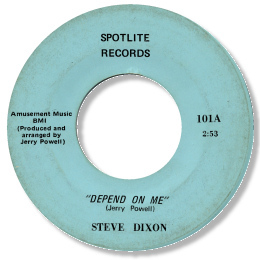 Depend On Me is a wonderful deep soul ballad in the grand manner, with Dixon’s deep baritone voice hoarse and pleading over a full horn section well up in the mix, and a sympathetic rhythm track. The pounding “Poor Man” on the flip makes a super double sider. If this 45 was on a better known label like say Goldwax or Fame it would be considered an absolute stone classic. It still should be. After this Dixon’s New Orleans recorded Instant singles are a bit of a let down, despite his excellent throwback hard singing style much in evidence on the great gospel intro to A Good Love Is Hard To Find. 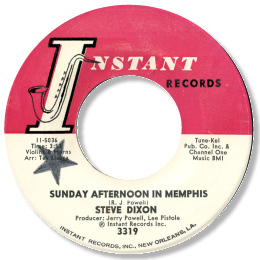 The gentle, rather meditative Sunday Afternoon In Memphis” was the first disc I heard by Dixon, on the radio while I was in New Orleans, and it was looking likely to be a big seller too. But again, label owner Joe Banashak was running out of steam and promotion for the disc suffered. His final 45 was one of the very last that Instant ever put out and again, business reasons hindered sales. Another shame for Steve Dixon. UPDATE ~ Jim Lancaster has written to say that he thinks the Spotlite 45 was cut at the studio he now owns, Playground in Valparaiso, FL. He has found doscuments that show producer Jerry Powell working there in the 60s, and points out that the publisher of "Depend On Me" was Amusement Music - one of the then owner Finley Duncan's companies. I think these are pretty compelling arguements. FURTHER UPDATE ~ As you can see from this updated page Gary Hart has very kindly sent both scans and MP3s of the astonishingly rare Smokey 45. "Help Yourself" is an uptempo funky little tune, and Before I Leave You is a very fine ballad with big horns. Another excellent vocal from Steve. FINAL (?) UPDATE ~ Jerry Powell has himself reported that both sides of the Spotlite 45 were cut in Mobile, AL with himself providing the splendid guitar licks. The session was remixed at Playground where several other sides were cut. Finley Duncan arranged the business side of the 45 - pressing etc even though Jerry paid the money out - and had the publIshing in return. Let's hope the other sides surface in due course. Thanks to Greg Burgess, Gary Hart, Paul Mooney, Jim Lancaster, Keith Glass and especially Jerry Powell for extra info.